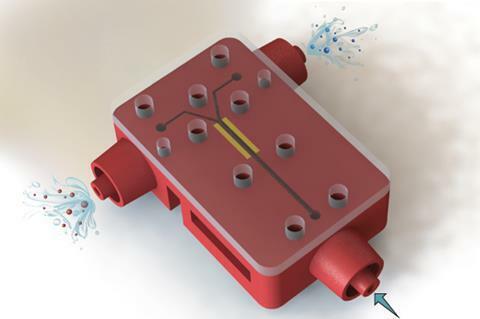 A new 3D printed flow electrolysis cell developed in Switzerland can produce hydrogen and oxygen from water, and commodity chemicals from brine, without a membrane. The system is a significant advance for membrane-less architectures in terms of output, and a step towards the direct conversion of excess renewable electricity into useful chemicals. Electrolysis involves passing current through a solvated or molten ionic compound to induce chemical reactions at electrodes. It’s a well-established technique in chemical industry; two notable examples are water splitting and the electrolysis of brine to produce chlorine and sodium hydroxide, both important chemical feedstocks, which is known as the chloralkali process. Commercially, these processes happen in cells divided by a membrane. The membrane enables the devices to use high pressures and current densities, reducing cost, and physically separates the products so that they can be collected at high purity. However, membranes degrade over time, causing a loss of cell efficiency and eventually, failure. Mohammad Hashemi at the Swiss Federal Institute of Technology Lausanne is part of a team that has been working to do away with membranes for some time – they developed a microfluidic membrane-less electrolyser back in 2015. Their new 3D printed electrolyser makes the jump from the micro- to the millifluidic scale. A carefully designed channel controls the flow of the liquid electrolyte, holding the bubbles against the electrodes as they form. They are then collected separately from each electrode. A wider channel leads to a 37-fold increase in throughput for water splitting over their 2015 microfluidic electrolyser. They also used the new device for the chloralkali process – the first time this has been done with a membrane-less reactor. Hashemi is very optimistic about the technology: ‘Removing the membrane can significantly reduce cost and encourage the adoption of renewable energy by this industry.’ He says the electrolyser could be used to store intermittent renewable energy in the form of chemical bonds during periods of excess production. This is the next step for Hashemi and his colleagues, to solve the engineering challenge of how to combine these units into a larger parallel system for real applications.